Vitesse Semiconductor introduced a new Network Interface Device/Ethernet Access Device (NID/EAD) reference design based on its CEServices software and Serval (VSC7418) Carrier Ethernet switch engine. Significantly, the NID/EAD platform supports MEF Carrier Ethernet 2.0, which is becoming a requirement in many RFPs from network operators. Vitesse said its design exceeds many of these requirements today, including line rate support for essential service creation and assurance features such as RFC2544, Y.1564, multi-operator OAM and Hierarchical Quality of Service (HQoS). 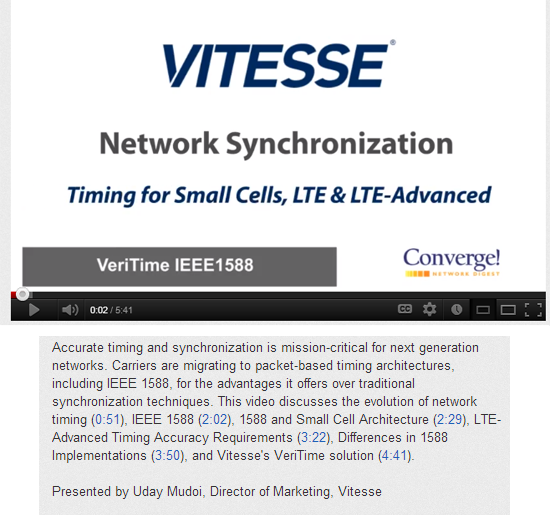 The reference design also integrates Vitesse’s VeriTime timing synchronization for mobile access deployments. 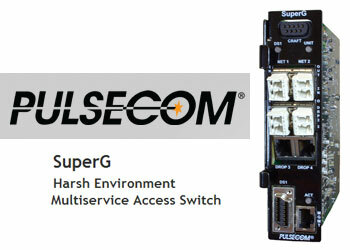 Pulsecom is introducing its new SuperG Ethernet NID platforms using Vitesse’s Carrier Ethernet Switch Engine. The CE 2.0-compliant SuperG access/aggregation platforms are designed for mobile backhaul, business services, as well as access and aggregation network and demarcation applications. Pulsecom, whose customers include many of the large U.S. operators, said it is seeing a definite requirement for Carrier Ethernet 2.0 and IEEE 1588v2 capabilities. SuperG OSP: CE 2.0-ready access solution optimized for outdoor use. Pulsecom's scalable solutions for Carrier Ethernet access and wireless backhaul deliver MEF compliant Ethernet services to custom fit any mixture of 1G, 2G, 3G and 4G/LTE applications. T-Mobile USA and Crown Castle completed their deal concerning the sale of approximately 7,200 towers for $2.4 billion in cash. The deal gives Crown Castle the exclusive right to lease and operate the T-Mobile towers for a weighted average term of approximately 28 years. In addition, Crown Castle will have the option to purchase such towers at the end of the respective lease terms for aggregate option payments of approximately $2.4 billion, which payments, if exercised would be primarily between 2025 and 2048. Deutsche Telekom said the proceeds have an immediate deleveraging effect by reducing its net debt by the equivalent of around EUR 1.9 billion and thus strengthening its rating-relevant financial ratios. Earlier this year, Crown Castle International acquired NextG Networks for approximately $1.0 billion in cash. NextG, which specializes in outdoor distributed antenna systems ("DAS"), currently has over 7,000 nodes-on-air and a further 1,500 nodes under construction. In addition, NextG has rights to over 4,600 miles of fiber. Over 90% of NextG nodes are in urban and suburban locations, with 80% in the top ten US metropolitan areas, including New York, Los Angeles, Chicago and Dallas Fort Worth. The NextG assets are expected to provide significant growth, as they currently average only 1.25 tenants per network. Crown Castle said this deal made it the largest independent DAS operator in the US, with approximately 10,000 nodes and 26 venues in operation or under construction. 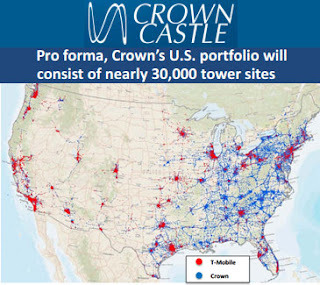 Previously, Crown Castle owned, operated and managed over 22,000 and approximately 1,600 wireless communication sites in the US and Australia. Deutsche Telekom announced cloud service partnerships with Box and Microsoft Office 365. Specifically, Deutsche Telekom is now offering Box Business in its cloud marketplace for small and medium-sized businesses. It will also soon offer Microsoft Office 365 as a cloud collaboration service. "Secure cloud solutions are a significant part of our Group strategy for more growth,” says Dirk Backofen, who is the person responsible for Deutsche Telekom’s cloud business. “When it comes to the cloud, there’s a clear trend: After the initial tendency to use the cloud purely for storing data, things are now moving towards collaboration. The cloud brings people together,” he says. The advantage for customers is that Deutsche Telekom offers them a complete end-to-end cloud service and provides everything from a single source: Bandwidth, storage space and processing capacity, applications, expertise, independence from operating systems and high security. Cloud services are an important building block, from which Deutsche Telekom will generate revenues in new areas over the coming years. Since launching its cloud marketplace inthe middle of the year, DT has registered 7,500 customers. The marketplace now offers more than 20 cloud services in areas such as accounting, storage space or video conferencing, with plans for 40 offers by the next CeBIT trade fair. 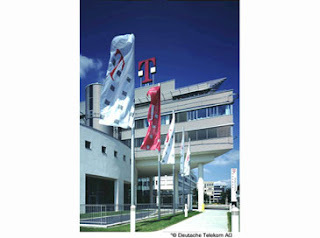 In addition, Deutsche Telekom has included integrated music services from Spotify into its cloud. In August, T-Systems is became one of the first partners for VMware vCloud Data Center Services, which is being integrated into the T-Systems' Dynamic cloud portfolio. The carrier is the first to offer this capability in Europe. vCloud is an Infrastructure-as-a-Service solution that allows companies to expand their internal IT resources with the cloud capacities of T-Systems. AutoScouts24, an online car marketplace for Europe, is the first customer. Actum/G2, one of the leading digital marketing agencies in the Czech Republic, is another customer.